You are here: Home > News > UAH Looks Back on 2018! 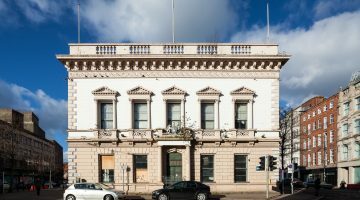 On Tuesday 2nd April 2019, Ulster Architectural Heritage hosted the Annual General Meeting at Old Museum Building, Belfast. As part of the event we looked back at the organisation's achievements in 2018. From ‘Bank Buildings’, to ‘Heritage Angel Awards’, ‘Heritage at Risk’ and ‘Bake A Building’ and much more, it certainly was an eventful year! Watch the short video below or read on to find out more about the activities of UAH. Your support helps us, help heritage. We would like to express our thanks to members, funders and followers for your support in 2018. Successful in securing funding from National Lottery Heritage Fund for the Old Museum: Back to Life project. In partnership with Belfast Natural History and Philosophical Society. Keep up to date by Signing up to our Newsletter, or support us by Becoming a Member, today!